As Airbnb hosts, we get an interesting array of guests here at Mermaid's Nest. Most people are perfectly nice - friendly enough coming and going, but there's no connection made, and we know we'll probably never see them again. A few are truly horrible. No point in dwelling there... we hope we'll never see them again. And then, every so often, we'll have guests who are nothing short of adorable. Those are the ones we wish would move in right next door and be our friends. 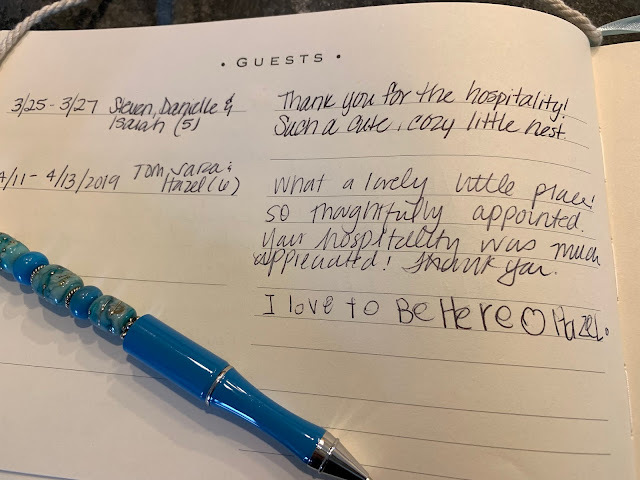 We recently hosted a family of three, just down from Seattle for the weekend. The mom and dad were great, but what was best about them was their daughter, Hazel. She was a curious and generous six year old, who loved to play on the beach, even in the rain. I'm about to admit something very embarrassing... I recently learned that narwhals are real. What??? I know. Ridiculous. And feel free to ridicule if that's your thing. But now I know. ... and I'm reading Soul of an Octopus, by Sy Montgomery, which has me completely smitten with those eight-legged wonders. So now I find myself wondering what other amazing things I'm completely unaware of after so many years on Planet Earth. I think I might even believe in unicorns. And Santa Claus. Well, duh. I wanted to make a bunny for my grandson's first Easter, but of course, coming from me, it had to be an unusual bunny. 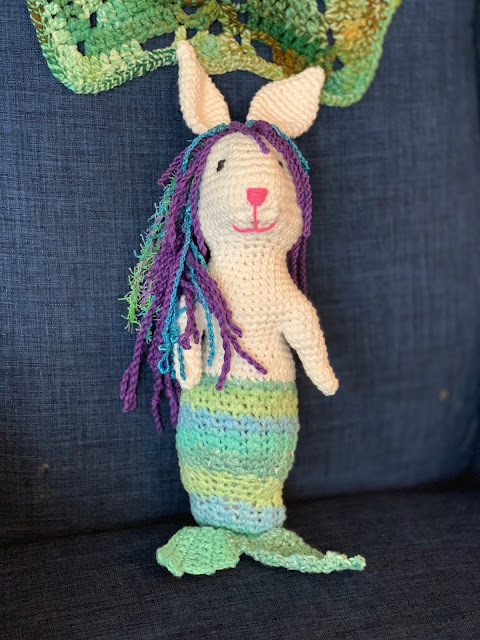 I've made a few mermaid dolls, so a MerBunny was the obvious choice. If mermaids are real, and of course they are, then why not merbunnies? I like my brand of logic. Don't try to change me. 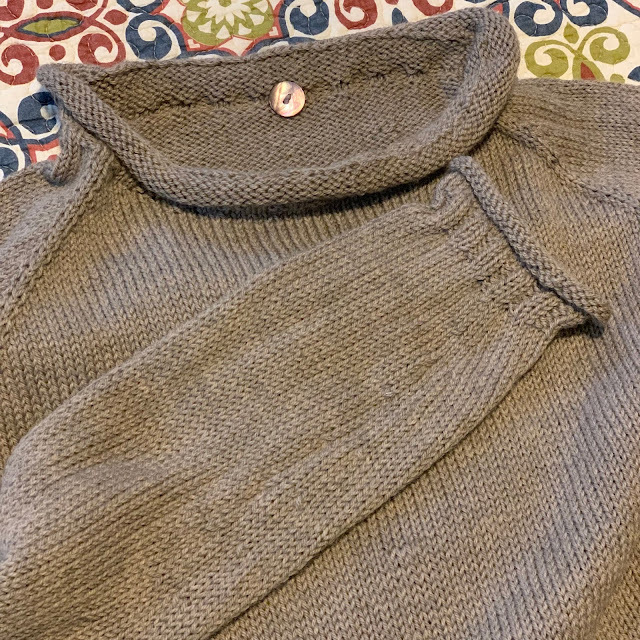 I've decided it's time to build myself a "slow wardrobe" of thoughtfully handmade sweaters that will last for years, and maybe even become family heirlooms of sorts. I'm tired of buying terrible clothes that don't last, that have no humanity, no soul. I want to take the time to make things that matter. I kind of always want to be wearing one handmade thing, to hold the rest of it together. I started with a very easy top-down pullover, which took me from October to February to make. That's pretty slow, but at least I finished it. I set it down for a while at one point, blaming the holidays for lack of time, but really because I was afraid of it. I was two inches from finishing the body and starting the sleeves. Sleeves freaked me out. Until I made them. (Fear of yarn is kind of silly, says me now, until the next scary yarn monster shows up in my bag.) I love this sweater in spite of its very many mistakes, and I wear often. 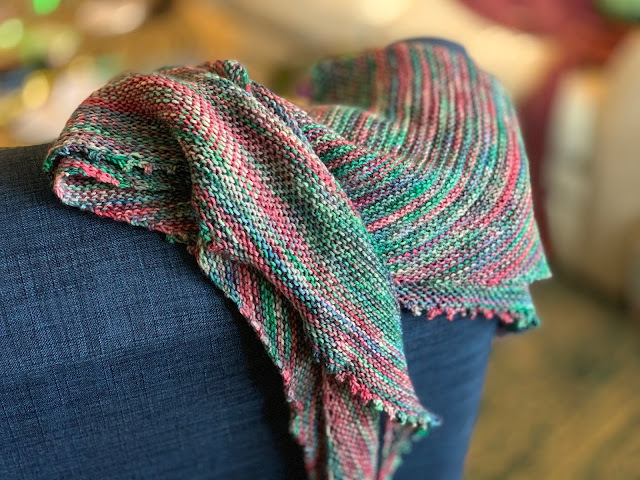 For some time now, Rick and I, along with a few other friends, have been knitting and crocheting prayer shawls, also known as comfort shawls, for the local hospital. We make the shawls out of washable yarn, usually acrylic, and then hand them over to be laundered in the hospital before being distributed. It worked well until the hospital updated its laundry protocol, and decided that even our shawls would now need to be bleached. Hours and hours of work go into each and every shawl. We knew they were already being washed in super hot water and going through the hottest dryers. Although all that heat and sloshing is not ideal for hand knit items, the yarn was standing up to the torture well enough. Bleach, on the other hand, would not only fade the colors in the yarn, but also deteriorate the fibers. 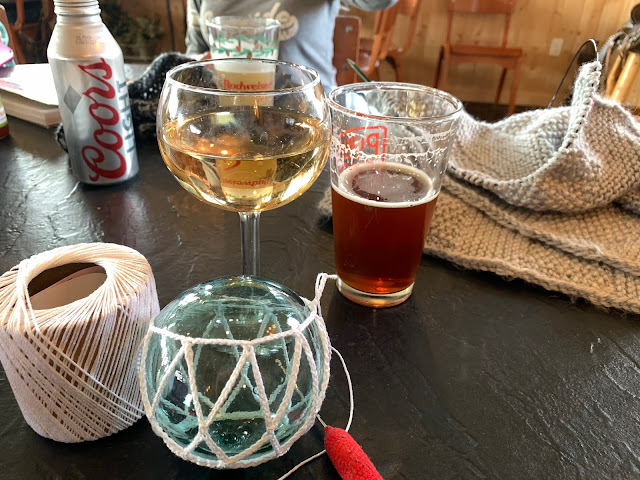 So after much discussion, and research into alternative yarns we might use, we decided as a group to put the project on hold. Our little knitting group is still going strong after a year or so of regular Tuesday knit-togethers. Until recently, we've been meeting at coffee places. Starbucks was nice, except that they played the music so loud we couldn't hear each other talk. Nothing more fun than a group of people over 50 all yelling, "Huh?! What?! What is this music???" Not so good for our attempts to not look like a bunch of old farts playing with sticks and string. We tried bouncing back and forth between two little privately owned places nearby, that just happened to be right across the street from each other. After a while though, as the cafe owners began to feel more comfortable around us, the vibe shifted. They both became more and more open about the vicious and unprofessional rivalry between the two of them. 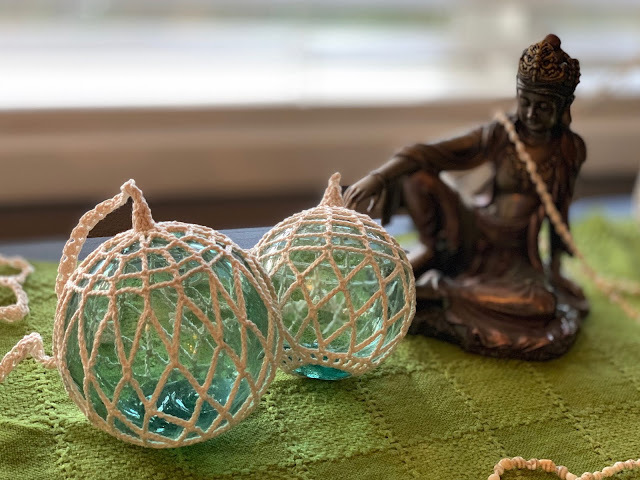 The verbal shrapnel-flinging was fierce and frequent, and it became so ugly and awkward, we felt the need to wander off in search of a safer place to spend our time and money. 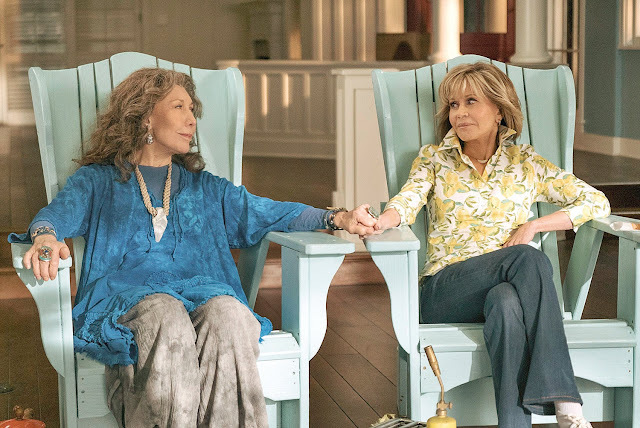 If today was Thanksgiving, and I was sitting at a table full of people taking turns sharing what they're grateful for, my contribution would go something like, I am ridiculously thankful for Grace and Frankie. Yes, the show. Jane Fonda and Lily Tomlin have much wisdom to share, and they bring it to us so entertainingly via Netflix. My daughter watches it, and often leaves it on in the background, because she likes the sound of their voices. They reassure her as only voices of years and experience can do. I like to think they remind her of me. They certainly remind me of me.